Simple and Easy to Use 6 Alarm Keychain Reminder. 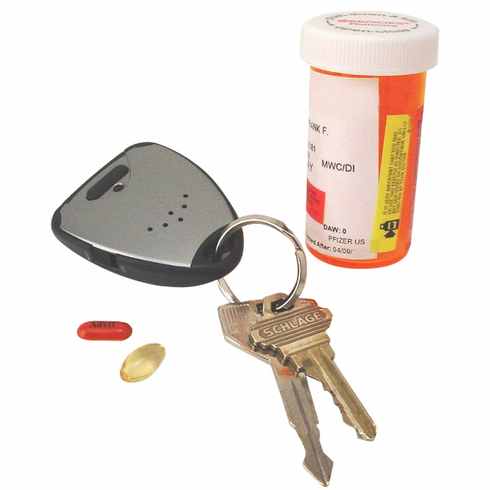 The e-pill Key-Chain Reminder is simple, easy to program and will remind you to take your medications every day. This Multi-Alarm has a strong beep signal. **Please Note** The timer needs to be programmed the first day by pressing the "ALRT" button at the time(s) you want the alarm to go off. Example: You must press the button at 2 PM to initiate the alarm that will go off every day thereafter at 2 PM automatically. After the first day of setting the alarms, the device will reliably remind you automatically at those times every day thereafter. Includes carrying pouch (if you do not want to use it as a keychain). Avoid Medication Errors! Size: 2 1/2 inch x 1 3/4 inch x 1/2 inch. Weight: 0.7 oz.